Paul Morley, a professor in the Department of Clinical Sciences and one of the foremost experts on Lasix and EIPH, is providing important new information to stakeholders in the debate over Lasix use in racehorses. 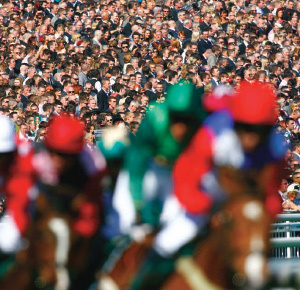 Three research papers have cast a spotlight on the controversial racehorse drug Lasix and the key questions around its race-day use in the US. A Colorado State University researcher has released new study results about the impact that bleeding in the lungs has on racehorse performance and the effectiveness of the most common treatment for the condition. The use of the medication was banned by the Breeders’ Cup last year in races that were limited to 2-year-old horses, but race officials reversed that policy and are allowing Lasix to be used in all races this year. The industry in North America is divided over its race-day use, with proponents of the diuretic arguing that Lasix protects horses’ health and improves performance, and opponents saying that permitting the drug is marring the sport’s good name. The Breeders’ Cup, a prestigious 30-year-old series of thoroughbred races, will be held over Friday and Saturday at Santa Anita Park in Arcadia, California. It will involve 13 Grade 1 races, with purses and awards totaling $US26 million. Recent research by Paul Morley, a professor in the Department of Clinical Sciences and one of the foremost experts on Lasix and EIPH, is providing important new information to stakeholders in the debate. Morley is part of a long-standing collaborative group that has published three new papers in the Equine Veterinary Journal that address the effects of EIPH on performance as well as the efficacy of Lasix in controlling the condition. In the first study, Morley and his co-authors studied EIPH in 1000 racehorses, and showed that the condition has detrimental effects on their ability to perform as elite athletes. However, in another study that followed the lifetime racing careers of more than 700 horses, the research group was unable to find an association between EIPH and the number of races the horses were able to run or their earning potential, except in the most extreme form of the condition. In the third project, Morley and his research team examined existing studies on Lasix and concluded that there is high-quality, albeit limited, evidence that Lasix is effective in reducing the incidence and severity of EIPH in racehorses. The finding supports the results of his team’s landmark 2009 clinical trial on Lasix. Ken Hinchcliff, dean of the Faculty of Veterinary and Agricultural Sciences at the University of Melbourne, in Australia, and one of Morley’s longtime collaborators on the studies, said: “These studies build on our earlier work to provide horsemen and regulators with the evidence they need to inform the highly charged debate about EIPH and Lasix. The Breeders’ Cup will be held for the first time under newly enacted national uniform medication reforms adopted in California and currently in the process of being adopted and implemented in other racing jurisdictions across the US. Breeders’ Cup runners will compete under California regulations and house rules that enforce three of the national reforms regarding medications, Lasix administration and accredited laboratory testing. From October 1, California adopted the Controlled Therapeutic Medication Schedule establishing permitted thresholds for medications that have been recognized as necessary for the routine treatment of illness or injury in the horse. Protocols will be in place again this year requiring third-party administration of Lasix as well as enhanced security that limits access to the horses on race day. Dr Dionne Benson, executive director of the Racing Medication and Testing Consortium, commended California industry players, including Breeders’ Cup Limited, for taking what she called important steps. The consortium comprises 23 racing industry stakeholders and organizations that represent thoroughbred, standardbred, american quarter horse and arabian racing. The organization works to develop and promote uniform rules, policies and testing standards at national level; coordinate research and educational programs that seek to ensure the integrity of racing and the health and welfare of racehorses and participants; and protect the interests of the racing public.